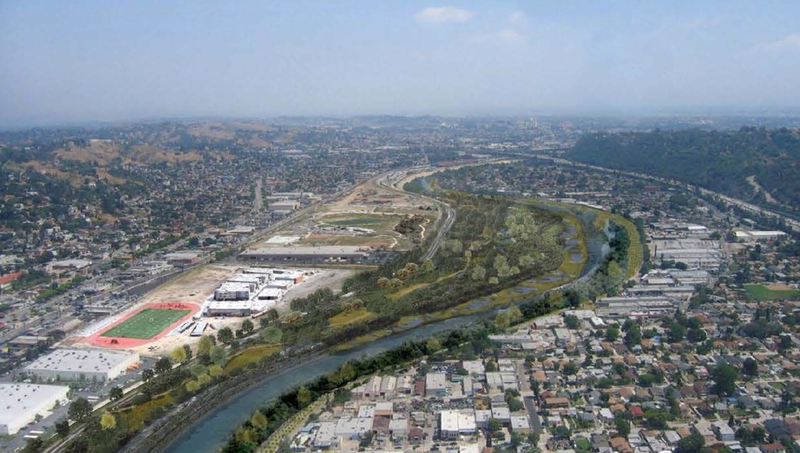 Not surprisingly, the U.S. Army Corps of Engineers on Friday released its long-awaited (seven years to be precise) study and recommendation on making the L.A. River look more au natural. The answer: restore 11 miles of the river bottom between the northern part of downtown L.A. and Griffith Park. In response, river activists are concerned that the plan will fall short of actually providing ways for the public to reach the river. The Army Corps will release their final recommendation in the spring. This is a huge issue, people — and if you care about Los Angeles, you should care about its namesake river. While cities across the globe have restored their rivers and built new parks and neighborhoods around them, L.A. has lagged. It could be — with a lot of work — a ribbon of parks and communities and something that works for flood control and for the city. It could also be very transit accessible, given that railroad tracks run along sections of it, particularly between downtown L.A. and Glendale. Thing big, people! THIRTY miles from downtown Minneapolis is the small city of Otsego, defined by its proximity to two highways and its investment in two wastewater treatment plants. Its one grocery store is a SuperTarget. Its walkability score, on a scale of 1 to 100, is 3.And yet, as soon as the housing market showed signs of resuscitation, building began again, workers started assembling swatches of sod into lawns and suburban pioneers were, once again, happy to colonize a cul-de-sac, confident that others would follow. Signs are mixed that sprawl will make a full-bore comeback as there are also signs that development in cities — often in dense areas, near transit — is coming on strong. The giant Rim Fire had closed the western side of the road. It’s now fully open again from east to west, providing me an excuse to post one of my Tenaya Lake photos (you can see Tioga Road along the left side of the lake). If you have only visited the Yosemite Valley and never the park’s high country along Tioga Road, then you’re missing some of the best parts of the Yosemite! I hope it doesn’t become a place for homeless and criminals to hide out. That’s how it is in the Riverside area along the Santa Ana River (and, yes, there’s water in it…sometimes). Other cities have great riverwalks – why not LA? Think Austin, NYC, the Seine…We’d need clear sightlines: lots of low-profile vegetation, trees, a broad walkway and bike path; attractive features like benches for pedestrians, adjacent playing fields or play areas and maybe kiosks (food? kayaks?) to address Patrick’s concern above. I’m not a planner, but easy access from more crowded parts of the city seems like an important way to keep the area busy and still provide an oasis in the City.